As most meeting planners and event organisers know, technological disruption has brought profound changes to the MICE industry. Today, meetings, conferences, and exhibitions are increasingly being planned, organised and managed using digital tools. Digital tools are becoming an integral part of strategic event management given their proven ability to bring in substantial benefits. Such as significant cost and time savings, higher attendee satisfaction, and better exposure and image building. Widespread digitalisation has brought us closer to a new understanding of communication within the meetings industry and being familiar with the key components this transformation is essential for planners, organisers, marketers, and anyone involved. 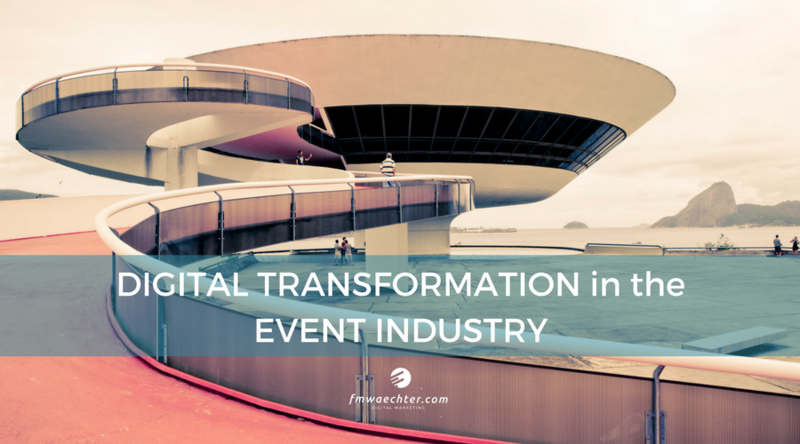 In this post, we introduce four concepts that can help you understand the foundations of the digital transformation in the event industry. If you thought that we live in a digital era, think again: experts believe we are in the early stages of the Age of Experience. This means that every event now has the potential to become an immersive experience marked by authenticity and lasting engagement. Technologies like VR, AR, and 3D can unify the digital and physical aspects of an event, help create bi-directional conversations between the different parties involved, and eventually become content marketing engines in their own right. Moreover, adding an experiential dimension to an event turns attendees into participants, and motivates them to go from being consumers of information to have an active role in the generation of knowledge. Artificial intelligence and related digital technologies, such as mixed-reality tech, are leading the digital transformation in the event industry. These tools enable organisers to create fully personalised environments in ways that were unthinkable only a few years ago. AI applications (like iBeacons, concierge apps, and chatbots) can quickly gather contextual and granular data about attendees preferences and behaviour and provide them with real-time and relevant information, delivering curated content and offering opportunities for feedback. In addition to helping organise attendee-led events, these tools allow organisers to plan future and more personalised events, facilitate research, and bring valuable insights into lead management, as long as they are used alongside robust data security measures. Despite the emphasis on personalisation, every industry event has a clear social and relational component. Conferences, meetings, trade fairs, seminars, and similar events can be considered living organisms that rely on deep networks and meaningful connections to prosper. This is why the concept of networked communities is central to the digital transformation in the event industry. Tools like social media chats and online forums facilitate the emergence of communities at a conference or exhibition and play a role in helping keep communities alive throughout and after the event. When creating networks between and within attendees is at the core of event design, the technology used goes from being a product to becoming a service that enables meaningful and lasting conversations between all parties involved. Digital tech is quickly becoming the backbone of events in the MICE industry. The digital transformation in the event industry is underpinned by the inclusion of experiential dimensions, the principles of UX design, growing personalisation, and networked communities that add human value to any event. These four concepts are far from short-lived trends since according to a recent report, nearly 70 percent of event organisers believe that digitalisation is here to stay. As time goes by, the implementation of events technology will give rise to new insights and opportunities. Events can become spaces for learning, interaction, innovation, and more, so now is the time to consider how you can take your event to the next level and jump on the bandwagon of digital transformation in the event industry. The post 4 Concepts To Understand Digital Transformation in the Event Industry was first published on fmwaechter.com. Author Frank M. Waechter.